Provides direct support for the thumb CMC joint while allowing full finger function Made of thin, 1/16" (1.6mm) perforated neoprene with a terry cloth liner that helps keep skin cool and comfortable. Reinforced stitching allows the splint to be trimmed below the thumb MP joint if desired. Specifically designed for osteoarthritis and medial subluxation of the thumb CMC joint. Provides gentle compression that helps relieve thumb discomfort associated with CMC joint arthritis and/or instability, tendinitis or repetitive motion. 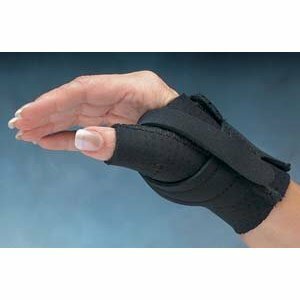 Contoured neoprene strap wraps around the thumb CMC joint and the first metacarpal for direct CMC joint support. Plus sizes are a half size bigger in the hand and a full size larger in thumb circumference to accommodate enlarged thumb conditions. Provides direct support for the thumb CMC joint while allowing full finger function Made of thin, 1/16" (1.6mm) perforated neoprene with a terry cloth liner that helps keep skin cool and comfortable. Reinforced stitching allows the splint to be trimmed below the thumb MP joint if desired. Specifically designed for osteoarthritis and medial subluxation of the thumb CMC joint. Provides gentle compression that helps relieve thumb discomfort associated with CMC joint arthritis and/or instability, tendinitis or repetitive motion. Contoured neoprene strap wraps around the thumb CMC joint and the first metacarpal for direct CMC joint support. Plus sizes are a half size bigger in the hand and a full size larger in thumb circumference to accommodate enlarged thumb conditions. Anti-microbial and is not made with natural rubber latex. Available in Black or Beige. To size, measure palm circumference.